Today I get to show you a very cool new Christmas image the Amanda has designed for us all!! I am so in love with this adorable little "Grinch" inspired image!! Let me introduce you to miss Tottie Sue Who!! Isn't she just the most adorable?!?! I loved coloring her up and creating the bubble ornament background!! She was so much fun and my girls were giggling the whole time!! We cannot wait to add this and more to our tree this year!! I promise to send some pics out into the world because we love "The Grinch" here!! We have a throw for the back of the couch and a tree skirt both of which I think are probably posted here somewhere from last Christmas when I finished them... maybe the Christmas before... who knows anymore! I put little Tottie Sue Who here inside the ornament and then put some red, green and gold beads inside for a little sparkle and bling. Then I added a little vinyl to the side there and Viola!! 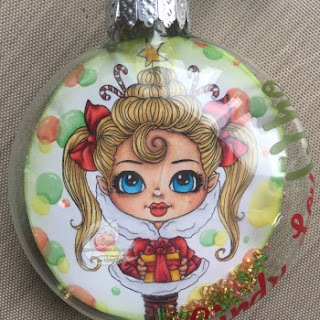 Christmas ornament!! Now I might have a different one to show you later... After I finished this the glass cracked for the 2nd time!! 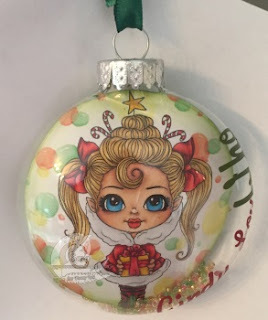 I cannot very well hang it on the tree like that with the tiny humans running around so will have to do it again... maybe she will end up on a different type of ornament all together... But for now enjoy this little sweetie!! And let her get your Christmas mojo flowing!! !